I been there and now I just buy a simple iron where the cord will go into the iron when you are finish. I use water when I iron so I have holes. I have my iron for about 5 years thinking I would buy another one each year. I paid about $35.00 dollars. I thought I give tell you my experience. I bought my Velocity when I worked at a quilt shop. It was expensive. I would never by it again. The iron shut off after 3 mins. It takes forever to heat up(5 mins). When I am sewing I felt as though most of my time was spent waiting for the iron to heat up. Also mine is fairly heavy, which is tiring when you have 500 half square triangles to iron. I still have that iron and it will last forever as I have stopped using it. I bought an inexpensive iron and decided if I didn't like it I could always donate it. The new iron which I love cost under $ 20.00 heats up quickly, not very heavy and has a shut off of 8 mins. UGH! Irons are such a wonderful and necessary tool but such a pain to know which one to buy. I have gone the Rowenta route and loved it for a short time until it started leaking. I hate that! We live in a small town where Walmart is the only place to shop and I bought a Hamilton Beach Durathon for about $30. and I love it. Lots of steam and nice and hot. It also shuts off when I forget, which is alot. The Quilt shop where I,spend too much time and money, is going the Durathon route because they liked mine. I had originally wanted the Oliso but I figured the $100.00 I saved can buy more fabric. When this iron dies, I will definitely get another one. I have the cheapest Rowenta from JoAnn's, which I did use a coupon on to make it, I think, less than $50. It's an iron. That's about it. Before that I had a super cheapo that I found in the top of one of my closets, I must have found a great deal on that one at some point in time. Worked fine for a few years, nothing special, until it finally started leaking. 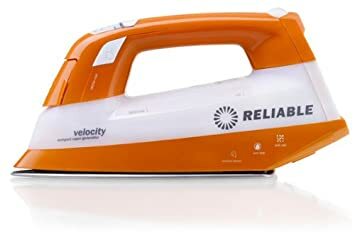 Anyway, the Rowenta has been reliable and I iron daily. Oh Yuck Nanette! You have my sympathy -- iron shopping isn't easy. I no longer love my irons 'cause eventually I know they'll betray me. I have an olisio now and it's ok. Like you though, I MUST have auto-shutoff. And it's not because I have people coming and going either LOL! I am using a Rowenta I got at either Target or Costco. It's not sensational, and I think it doesn't heat up as well, so probably on it's last legs. I blow through irons like everyone else. 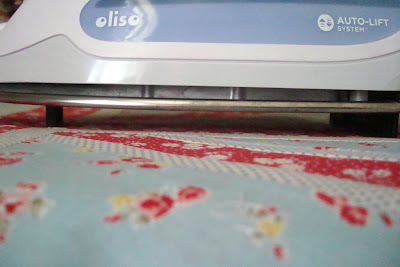 The thing I don't like about cheap irons, while they deliver on heat and steam, their soleplates are often rough and pull on the edges of things, so you get that weird wrinkled up patchwork piece that's ruined about half the time. Anyway, I do have an Olisio as a backup, I haven't taken it out of the box yet. I probably should use it so that I have the old rowenta that's in critical condition stored away where I can get it when the Olisio betrays me. which you know it will. Irons. It's a love hate thing. I've seen a lot of Oliso hate lately. The reason people like thrift store irons is the reason people love old heating pads. Back before people would sue you for spilling hot coffee on them, stuff actually got SCREAMING HOT! And some people die and their kids donate stuff, so sometimes it isn't in a thrift store because it's bad. I got a giant olfa mat for $2 one time and a pfaff for $10. Sometimes people just donate their relatives things without looking into it, which I think is sad- but I do feel better that someone like me who can appreciate it gets it. it doesn't matter how much you pay. they all become incontinent at some point in time. now i usually just buy whatever the cheapest model is at costco. right now, i think mine's a shark. i'm sure it'll die soon. I have a Rowenta (basic model) for over 10 yrs. It was a gift so I have no idea what it cost. It's never leaked, gets hot quickly, doesn't shut off but sorta cycles on and off to maintain the set temp, great steam. The only iron I ever had that I hated was a Black and Decker that shut off automatically and then took forever to heat back up. Nonononono... I do NOT like waiting for an iron to be ready! No! Have I ever loved an iron like I love my sewing machine? No... what's to love? If the iron does it's job, then I'm happy. I went with the cheap Black and Decker. It doesn't have auto shut off, but in my child free house, that's okay, and I have it hooked up to the same switch as the lights, so I don't need to worry about forgetting to turn it off. Too many leaky Rowenta's in my life to ever go the expensive iron route again. I kill irons, they never make it to two years. I gave up on the expensive ones and just go to walmart and buy a twenty to thirty dollar iron, and don't throw away the box. When it dies I take it back. I had an iron last only four months. It went back. Irons - gotta' hate 'em! I'm using someone's suggestion of never adding water - just keep a spray bottle handy and that works okay for me. I was just fed up with leaky messes. The Walmart iron I use now doesn't heat up as hot as I'd like and shuts off too soon. The iron I use in FL is great, but I can't find another. Never ending struggle because I also use my iron every day. I've been throught the iron thing way too many times. I tried expensive and went back to cheap...now I am middle of the line. I have a basic Rowenta. I like it so I hope it lasts a while. I know it won't go forever. I chose it because I liked the sole plate and the feel of it and the auto shut off. I just bought a gravity feed steam iron and I'm hoping it will do the job. It will be here Friday. I've been so through so many irons and none of them has ever been the perfect solution. The gravity feed iron has a 1 gal water tank that hangs above the ironing surface with a 5' reach and a button to push for steam. I've heard good things about them so I'm hopeful. I'm a garment sewer as well as a quilt maker and a longarm quilter. Hopefully this will work for all three. I got it at WAWACK for $109. Good reviews - hope they're true. They had oth those Reliable irons at Block Party in Portland. They are nice irons but they are HEAVY! The blue one was heavier than the orange one and I thought my wrist was going to fall off. They make incredible steam though. The placement of the steam button was in a different place on each iron and we kept hitting it by accident. I have to say, I wasn't impressed with either of them. I am waiting with baited breath to see what you decide. Irons have been such a frustration! Now I buy the el cheapo's (which last about a year) and replace them. I figure at about $25 that it's no biggie to toss them and start over. But, as a consumer, I also dislike being so wasteful. With so many quilters expressing the same frustration, I would think someone in the industry would come up with a decent iron for those of us who use one every day. What a can o' worms this one is! I have bought iron after iron after iron and finally decided that I would get the cheapest iron I could find and been the happiest camper ever. I've been admiring the fancy ones with the auto lift but I really don't feel the heart strings tugging to take that leap. So, I'll keep plugging along with my $9.99 iron from the dollar store. Good Luck! I replaced my iron (awful ... black and decker i think) at Christmas and did the same thing you did ... could not decide! I went with the basic Rowenta, and it's been fine, although it drinks water at an alarming rate. It's too new to have any problems, knock wood. So far I like it fine. I like a heavy iron that means business, and this one does. If you buy a $100 dollar iron and use it for two years... that comes out to $0.13 per day. I think you get what you pay for in most cases. OK...I have a VERY OLD General Electric iron that I use everyday! No it doesn't have a cut off switch, I have it plugged into a power strip that I flip off with my foot when I walk away, and flip back on when I come back. How old is it? Well both of the little metal prongs on the plug are the same size! Did I just tell how old I am? Geez.. Sorry I am not much help, but I love my old iron almost as much as my featherweight! That said, now it will probaly kick the bucket! At the risk of sounding a little goofy, let me tell you about my iron! I have the Rowenta DW5080 Black Focus Mercedes Benz Fashion Week LTD 1715. I tried out a friend's when she got it a couple years back and the steam was so awesome and the iron was just perfect. I bought one on ebay and it was about $110.00. free shipping. I just looked and it is still on there. The people were great and it has worked tirelessly ever since. Plus it's a cool black finish and the only Mercedes Benz I'll ever own! Good Luck! Preach it sister, preach it!! Irons make me crazy. Paying $100+ and having it last for less than 2 years is the story of my life!! I can't wait to read what your wise readers have to say. Haven't tried Reliable, only Rowenta and Olisa. I've become so sick of irons wearing out that this last time, and you know there have been about three irons in the last five years, I sent my husband to Walmart and told him to buy the highest wattage, largest base iron. He came back with a $30 something, and it has been great. When it wears out, I'll just go get another! I've stopped thinking of them as an investment and have stopped expecting to be using the same one for 20 years. The burden has lifted! I have several irons for different uses. Black & Decker with teflon plate that I marked it 'only iron transfer' and have a Rowenta with silver plate that I use for general ironing. Have the travel size Rowenta that gets hot that I will use when doing lots of HST, light weight and has SS shiny plate and the other day I tried to use water & steam but only got rusty looking spots so never again, only dry ironing. Got a Rowenta at garage sale for .25 cents, she said one of the buttons didn't work but it get really hot and that all I need. Instead of using water in it I have a spray bottle near by that does the same thing. So don't spend lots of $$$ buy middle of the road. I actually have been using a Black and Decker from Target which works fine, but dropped it a few times so ones in a blue moon the sensor doesn't shot the iron off when it warms up to temperature. The only thing I don't like about it is the plate which has only a few, but rather large holes on it for steam, but the holes are concave and they leave a stretch mark on fabric if I only press and don't move the iron a little while steaming. My friend has a Rowenta which I use at her house to iron for her and that one has the 400 hole plate which I LOVE! I can suggest to get that one, it works perfectly and I know She's had it for years! It's about $85 on Amazon.com. Good luck with your search! Good luck. I use a $35 Sunbeam. No dramas. Same one for years. I had a more expensive one and didn't last any longer than a cheaper one. But it did iron beautifully. I did some research and bought this one and I am happy with it, I've had it for 2 years now. For an iron it is very well behaved. I definitely agree with Lynn ... Myself and two friends all bought the Black & Decker Digital Advantage and are LOVING IT!!! Under $50...or less w a coupon at bed bath. & beyond. You will not be disappointed- it's got the weight and heat of a Rowena but not the price. We all sew a lot. I am tough on my irons. They don't seem to last long so i buy cheap!!! Good luck with your search! Oh the old iron problem! I have the orange Reliable and just love it. Will always use it, it is going on 2 + years and going strong. If you like a lot of steam, this is for you. I also have the blue one, steams when you touch the handle and gets very hot. Does not leak! The Rowenta, cost a ton and it leaked. Good luck! It's fascinating to read that so many people have problems, I thought it was just me! Some of the irons mentioned here I have never heard of in the UK. At present I have a Morphy Richards Steam Turbo, which is OK, but not great. Not sure if these are available in the States. Good luck with the search, Nanette! Hope you find the best one for your needs! With so many products around it can be really tricky to get the right one. I found the best iron at an estate sale. Brand new with the tags still on it. It is by General Electric. I love it. It is just like the one my grandmother had cloth cord and all. I just have to be careful with he heat. But other than that it is wonderful. I recently bought a Singer Perfect Finish iron on Amazon. It gets very hot, has lots of steam (big tank), and it doesn't leak or spit. It was less than $40. So far I love it! I've just recently bought that $200 Reliable Iron... it's way cheaper on Amazon, but JoAnn's beats that. So far I really like it. Most irons make steam by dripping water on the soleplate. This one has a separate tank that makes the steam and then spits it out. Supposed to last longer and work better? We'll see! It's auto shutoff is longer than most, which is nice. You can completely override it, but I forget it too often, so I choose not to do that. I've heard that Rowentas these days are only good if they are the ones made in Germany - not the ones made in China/Taiwan, etc. That could explain why my old one lasted 10 years, and the new one only a couple. I have only one word for you. ROWENTA. I have a Rowenta travel iron that I got with a discount coupon from Bed Bath and Beyond that I love. It heats up quick, has an efficient steam setting and has its own travel case. I think the original price was $50.00. The other iron I have and like is a Panasonic cordless iron for $99.00 several years ago, it heats up quick, has a good water reservoir and has an auto shut off valve. The one think you have to remember is to put it back on the heating plate. It has a cover that makes it convent to carry and take away when going to class. I like both for different reasons, but show both the small and large end of the range of urns. I bought my Rowenta at Costco. I find that as long as I use a spray bottle rather than the steam feature it lasts longer. Costco has a wonderful return policy so if it dies they let me return it. After 3 years when it dies I purchase a brand new one and start a new clock (my choice not theirs). Just because they are wonderful with taking it back I don't want to take total advantage. I'm late to the party but I'll chime in. I have two Rowenta irons, one for the ironing board and one for travel. The one on the ironing board is the Rowenta Focus and I really like it. Plenty of steam, smooth sole, quick heat up, no leaking, and auto off. Also it's pretty heavy which I like because a heavier iron gives you a cleaner seam and presses wrinkles out better I think. I paid about $75 for it and I've had it 2+ years and it's still going strong, even after 1 drop from the ironing board. The Rowenta travel iron is just OK. It's good for piecing quilt tops and doing a quick seam press at my machine rather than getting up to the ironing board. It's still heavy enough and has a smooth sole plate, but doesn't have an auto off. I've come back 2 days later and it's still on. Yikes!